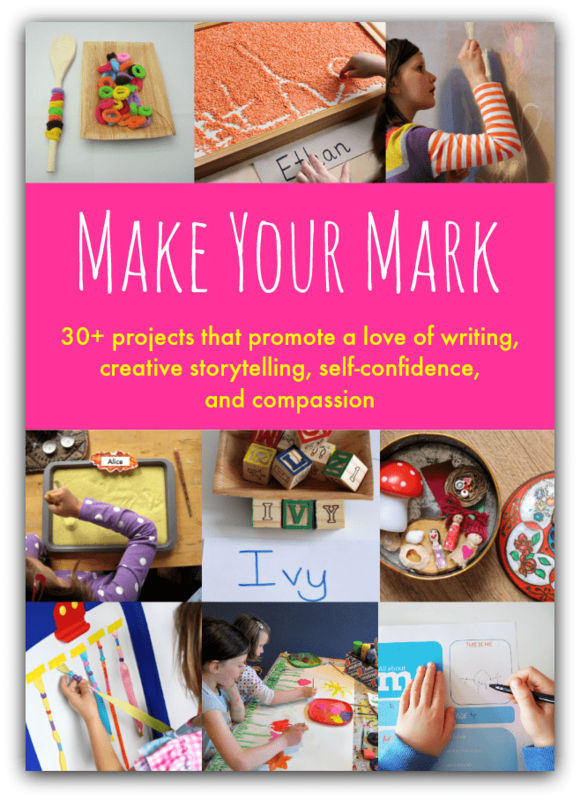 My new book, Make Your Mark, brings you 30+ projects that will help your child develop a love of writing, creative storytelling, self-confidence and compassion. Through play, art, language, and writing this book will help your child discover themself, and make their mark on the world. Make Your Mark will help you take the simple act of sharing stories and stretch it to help your child develop their confidence, compassion and caring. Storytelling has been central to communities for centuries. Stories let us see into the lives and feelings of others, and our own writing helps us explore ideas and discover who we are. This book will build your child’s love of writing, with practical skills and creative inspiration. It will also nurture your child’s social skills, helping them to understand others and be a great team member. They’ll see how, although young, they can already make their mark on the world, through simple acts of kindness and citizenship projects. Get this book for * free * when you choose the bonus bundle! This ebook costs $14.99 and you can buy it here. Or choose our bonus bundle and you can have this book for free. You’ll receive a copy of ABCs and 123s, and Up!, along with a free copy of Make Your Mark. 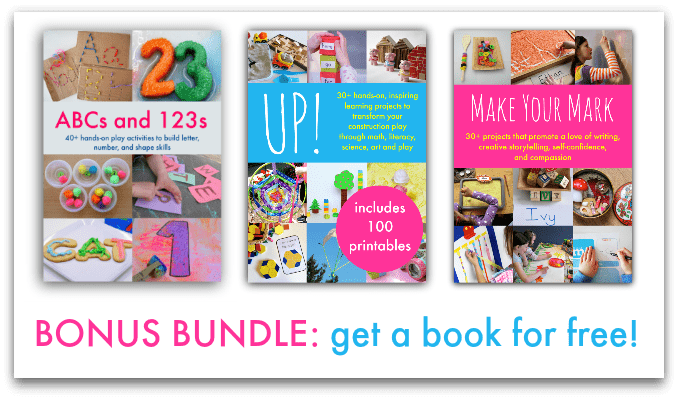 ABCs and 123s gives your 40+ hands-on play ideas that will help your child build their letter and math skills. The activities have been carefully chosen to offer a wide range of math and literacy skills, working across the curriculum to incorporate play, imagination, science, sensory, and art. Buy two books at the regular price of $29.98 and you’ll get the third book for free! Click here to choose the bundle and get ABCs and 123s for free. :: Activities to get your child started with the important basics: to develop skills to literally make their mark, first with fingers, and later with pens, pencils and paint brushes. :: Fun ideas that will help your child develop their fine motor strength and dexterity. 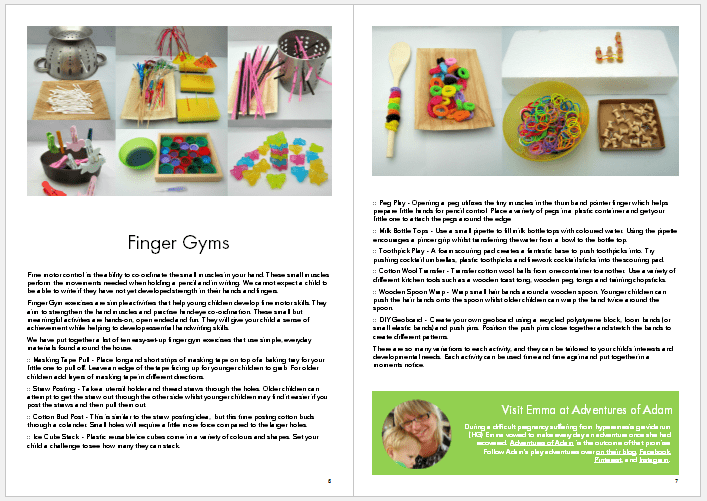 We have ideas for finger gyms, easel activities and first mark making activities with sticks, play dough and shaving foam. :: Great ideas to delight in imagination and storytelling that feels like – and is! – play time, not school work. Your child will develop their language, vocabulary and fluency through story mats, small worlds, comics, journals, role play, outdoor adventures, and art. 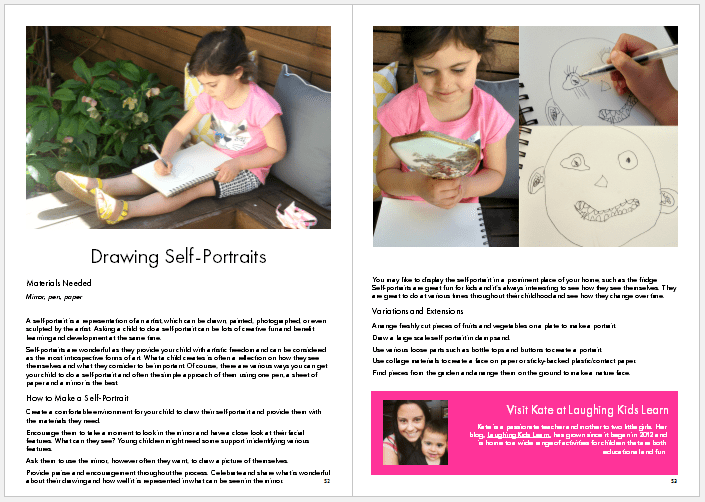 :: Activities that support your child in understanding themself and others, through interviews, self-portraits, collaborative art, and collaborative projects. :: And finally we help your child see that everyone can make their mark on their community and the environment. We show you how to extend the idea of our self out into the world, and consider how we are part of a community. With accessible and achievable projects we’ll inspire your child to make their mark through environmental citizenship and acts of kindness. 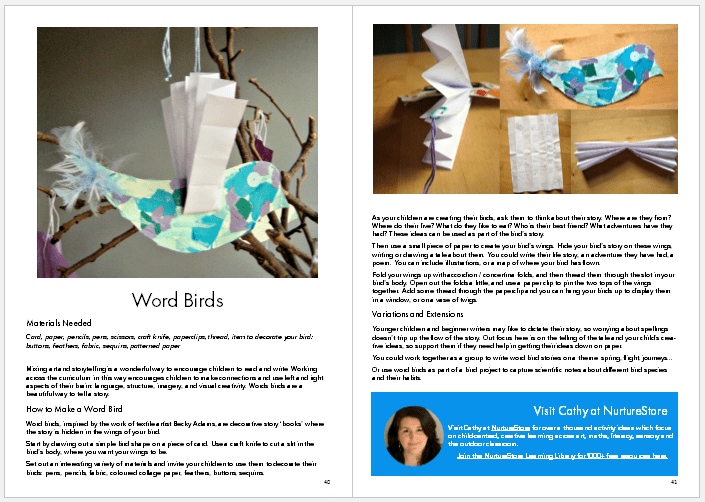 :: Also included: six sets of printables for you to download, including pattern writing cards, a ‘my favourite things’ photo book, ‘all about me’ interview sheets, pretend play post office accessories, and comic book and gracious giving printables. The book is wonderful for children from around age three, up to around age ten. Hello, this sounds very interesting! To Which age would you recommend this book ? Hi Tair. The book is great for children from around age three, up to around age ten.